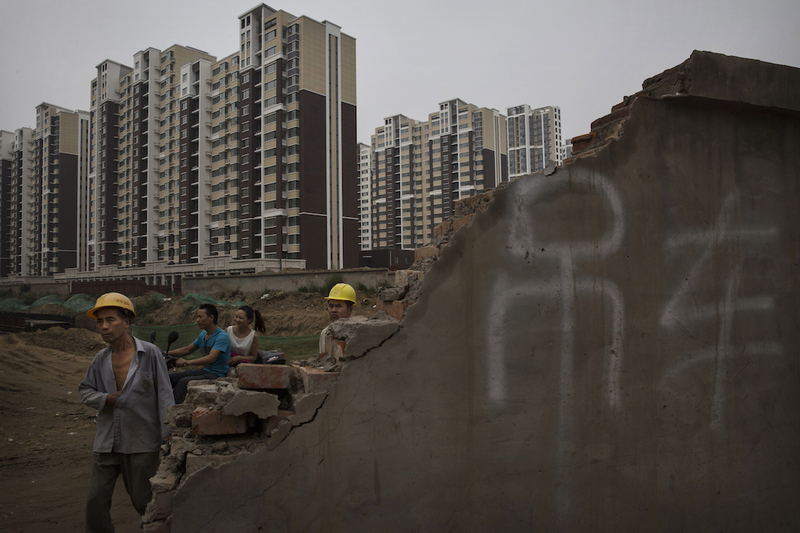 Workers at an apartment complex construction site in Beijing, August 2014. Rapid construction and widespread over-investment in Chinese property created a bubble that continues to deflate. By Caixin Editor Hu Shuli. This article was first published by Caixin. Having banks and local governments deleverage and trim overcapacity are part and parcel with central government efforts to maintain stable growth by nurturing the supply side of the economy. But even as this is happening, the housing market has been flooded with new loans in recent months, exposing the economy to new risks. The central government has identified industrial overcapacity and excessive debts that banks and regional governments have racked up as two of five key problems it needs to address this year. But many heavily indebted local governments rushed to roll out stimulus policies, such as discounts on home loans and lower down payment requirements so people can buy more homes, in a bid to address an oversupply of housing. Banks are keen on channeling their lending into the housing sector as the market heats up. Some online peer-to-peer lending firms, teaming up with big real estate agents, have also joined the fray by offering home buyers loans to finance their down payments, even though the practice breaks government rules. Regulators in Shenyang, in the northeastern province of Liaoning, went so far as to allow recent college graduates to buy a home entirely financed with bank loans, a policy so controversial that authorities quickly abandoned it. These actions raise a major question as to whether regulators are really serious about deleveraging. The peculiar decision made by many local officials to ease curbs on home loans might be the result of a dire need to reduce the large stockpile of unsold properties in their areas. Some property experts estimate that homes covering an area of 6.67 billion square meters have gone unsold, and most of them are linked to big debts. The International Monetary Fund calculates that China will need four to five years to absorb the huge stockpile. We believe that small cities might never be able to sell all their homes in some ghost towns, the new housing complexes that sit mostly empty. Stepping up the pace of trimming housing overcapacity makes perfect sense because the property market has been such an important part of the economy. The central government has done its bit to help solve the problem by unveiling new policies last year aimed at spurring demand. But the need to address the problem should not derail our efforts to bring down levels of debt at banks and local governments because solving one problem by creating another one will not help us make progress. Stimulating the property market via reckless borrowing will lead to risks on multiple fronts. A bubble has begun to appear in Beijing, Shanghai, and Shenzhen. Meanwhile, there is no sign that many smaller cities with acute oversupply problems will get out of their housing slumps any time soon. Also, regulators do not have good information on how much the economy is exposed to risks linked to housing loans because many creditors extend loans via the gray market, which is not on the radar of regulators. In addition, banks are weak regarding risk control over the loans they extend. Cash-strapped local governments are also more tempted by the availability of new financing than the need to curb debt levels. Like the bull run in the stock market a year ago, soaring home prices in big cities are a result of excess leveraged buying. As the economy continues to slow, investors will have fewer tools to secure their investment and it will be natural for them to put their money into the warming housing market. Chinese businesses, which are often mired in heavy debt, will then have more difficulty trimming capacity. Indebted governments are in no less an awkward position when it comes to controlling debt because they are inclined to borrow more in a bid to delay an economic slump. As such, they appear justified in encouraging individuals to take on more debt to bolster demand. However, soaring personal debts are likely to cause a bubble of their own, and once it bursts, indebted families with little money at their disposal will be most affected. They will have to cut spending, which will in turn undercut demand and industrial output. As to what kind of disaster this vicious cycle could bring upon us, the subprime mortgage crisis in the United States in 2008 serves as a vivid reminder. Issues that result from higher leverage in the housing market have already alarmed the authorities. Regulators in Beijing, Shanghai, and Shenzhen have clamped down on home purchases funded via the gray market. Shanghai’s government also raised the amounts that buyers of second homes must put down from around 40 percent of the purchase price to 70 percent. We will have to wait and see if these measures work. In the future, regulators from different government departments must work closely together to draw up long-term solutions to the problem if they want to address reckless borrowing. The authorities should move quickly to improve legislation so developers and individuals guilty of breaking rules get out of the game. They should also forge ahead with reform of financial oversight so we have an integrated system of supervision. Another priority is developing a unified credit system that covers people’s banking transactions, tax records, and dealings in the property market. Authorities will also need to show resolve in wrestling with vested interests so we can move quickly on real estate tax laws. The real estate market, which carries so much weight, has been a driving force for breakneck growth for more than two decades. However, it has reached a turning point because growth is slowing and the market is more fragmented than in the past. Demand for homes and growth in investment in the property market will slow between now and 2025, a government think-tank has found. So we must act now to reduce overcapacity, but fighting this problem should not come at expense of our efforts to rein in debt. Shedding overcapacity will not only be a test of our endurance amid slower growth in the short and medium term; it is also an issue that will make or break our economy in the long run.